I know it isn’t even Thanksgiving yet. And this year, like most years, I have exceptions to consider, but I’m wondering… is it too early to decorate for Christmas? Usually if I don’t have my tree up by now, I don’t have much time to enjoy it. But this year, we’ll have more time to celebrate Christmas. And I don’t know how much time/energy I’ll have to decorate after baby. Here is the dilimma. I have already taken down all of my fall stuff. As it has snowed already, I don’t think it is inappropriate to put up Christmas stuff outside. We may never get another opportunity!! But I’m struggling with indoors. So many of you have a head start and I get it. We pretty much dismantle our homes for one season and enjoying it for less than a month doesn’t seem fair! I think I can manage to hold out until this weekend. And then it’s on. This year’s theme, red and white in a hopefully very minimalist kind of way. Here is a picture from a fellow blogger, Jennifer over at Celebratingeverydaylife.com, of a porch that I am coveting. Don’t you just LOVE it?! How about you? Are you decorating already? 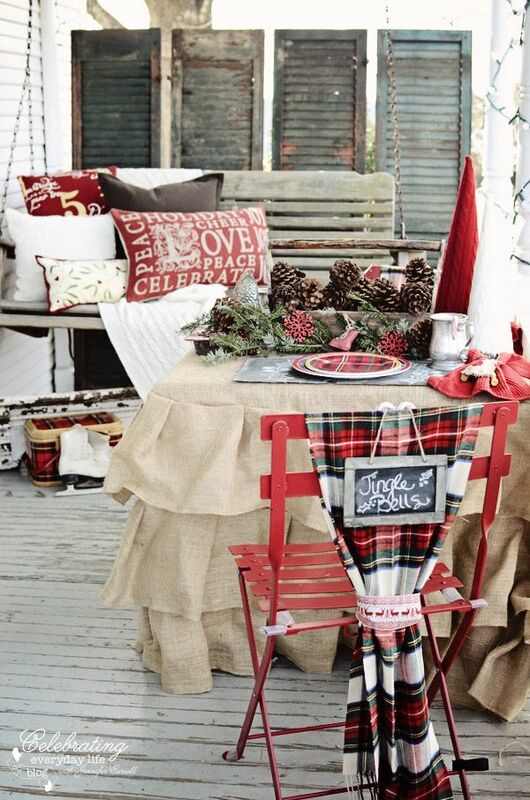 For more inspiring holiday decor ideas, follow me on Pinterest- Holly @ Style from the Sticks! 10) I had my hair done the other day and it came out brassy. Not a good look on a pink undertoned, ashy blonde. Now I have to have it redone. I was trying to be efficient and prepared for baby’s arrival. And now I’m wasting time. Here’s the reason I should shut up- someday I’ll be a corpse whose hair will not matter- brassy or ashy. 9) I’m so tired of waking up every two hours to use the bathroom. Why I should shut up- soon I will be waking up every two hours to feed a newborn. 8) I am struggling to get any lingering projects finished. Story of my life, I know. But it is even worse now. I get distracted by really important things such as napping and watching True Tori. Reasons I should shut up- I’m not working ten-hour shifts on my feet every day. 7) I’m down to the very last of my maternity clothes. And I simply don’t care if I’m wearing leggings every day and breaking all kinds of fashion rules. It is survival of the fittest in my wardrobe right now and if my shirt isn’t long enough, well then you probably should just look away. Why I should shut up- I have at least one maternity winter coat that will cover my belly although I’m normally too hot to wear it. 6) I’m not sure anyone, ever is really ready for a new little life to appear. And my attitude has been pretty nonchalant about it. I’m sure after the baby’s birth, we’ll be making an emergency run to Target for all the things I’ve forgotten to pick up on the way home from the hospital. But it is my fourth baby and as long as its feed and changed, life will be good. Why I should shut up- soon I’ll be rocking a sweet-smelling little bambino. 5) This is also the point of pregnancy that you start to dream about running and doing all sorts of exercises that you can’t possibly imagine your body accomplishing right now. You see an athlete on TV and have jealousy issues. Why I should shut up- after the baby, running will be the last thing I want to do. 4) I feel tugged in all directions lately with responsibilities. There are lots of projects like Christmas programs and craft sales and volunteering at school that I’m normally helping out with or directing that I’m struggling to back away from this December. Why I should shut up- I’m giving others the opportunity to step up and lead. 3) My computer is on its last legs. The battery is shot and it restarts itself at least once a day. Not to mention how slow it runs. Why I should shut up- it is still working, I haven’t lost all my data yet and Black Friday is the next week! 2) I feel like I’m running a 100 errands to try to prepare for baby knowing that with Christmas coming up, there will still be 100 more to run after baby. Why I should shut up- I have great friends who will help run a kid to school for me or watch my children should I need them. As soon as I get rid of something or throw something away, it seems I’ve stumbled across what I should have done with it. Perhaps this is why I have the tendencies of a hoarder. So many ideas, so little time! Case in point, old clocks. I can’t tell you how many clocks I’ve picked up at yard sales or Goodwill or even brand new from Hobby Lobby that just don’t work. The hands get bent, I can hear the clock ticking but the hands don’t move, the hands fall off inside, something is always going wrong with these cheap clocks. And until now, they’ve made their way out of my home broken. But recently, I’ve seen some really fun uses for broken clocks. These ideas may seem obvious to most of you, but they are new concepts to me. And that is exactly what I did with this small little alarm clock. I purchased it new from Hobby Lobby and it promptly broke immediately. So I dismantled it. And here is the final product. I added a little sticker to the front that I happened to have in my craft supply. Now, this could have easily been a picture frame but I thought the back was too pretty to cover up. So now it is a ticket holder, memory box! All from a broken alarm clock. Some other ideas for this capsule could be to store little girl hairbands or even something as simple as earrings! Tell me, what ideas do you have for broken clocks? Here’s a picture of my nails….not even 14 days later. One perk- it really did remove easily. And my nails didn’t look all shriveled and thin like when you remove the real gel polish. That was nice! Now to find a week where I won’t be so hard on my nails…. Hm, maybe when I give birth? Not sure when this magic week will happen as I feel like lately I’m stuck in an episode of Rehab Addict. Until then, I wouldn’t rush out and purchase said nail color. If you really want the real thing, spend a few more dollars and get it! It’s that time of year again where the women’s group at my church hosts a Pinterest craft party at the local kickoff for Christmas city event. And I’ve been busy getting some crafts lined up. What would you do with the all white Christmas tree? I, of course, love its all white plainness because that’s me. But I know that’s not everyone’s taste. Any suggestions?